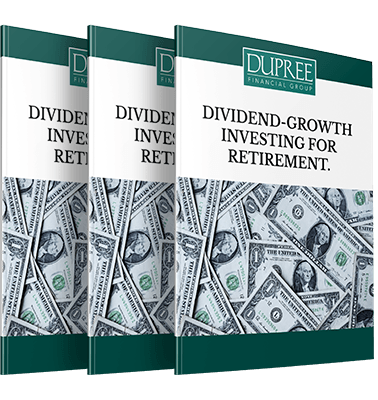 Dupree Financial | Dividend-growth Investing For Retirement. Focused on people, not just numbers. approach to managing your money. Your financial path is unique and so is our approach to managing your money. Tom Dupree, Jr. founded Dupree Financial Group on the principle that creating long-term relationships with people — not just their money — is the key to successful wealth management. The bond between our team and our clients is a crucial one. When we really get to know you and your priorities, we can guide you in the right direction no matter where life takes you. Learn about our approach, our team, and what we can do for you. potential benefits of dividend investing. We are diligent researchers. We aim to keep you informed every step of the way so you can feel confident that you’re making sound financial decisions. Our latest report provides an overview of the considerations and potential benefits of dividend investing. Financial insights, reactions, and guidance from Tom Dupree. Subscribe now to receive our latest Newsletter. Receive quarterly updates on market trends and investment strategies. © 2018. All Rights Reserved. Dupree Financial Group.